Multi Me is a secure social platform and online person centred planning toolkit created for people with learning disabilities and their Circles of Support. The multi me secure social network helps individuals and families build their own Circles of Support online. It enables the communication, co-operation and joined-up support of the individual involving family, friends, professionals and community circles. The multi me toolkit provides a range of accessible and multimedia based social applications designed to support people with learning disabilities with their self-advocacy, self-determination and independence. multi me the product is a concept originating from best-practice examples of Person Centred Planning (PCP), Circles of Support models and Multimedia Profiling (MMP) approaches with people with learning difficulties. 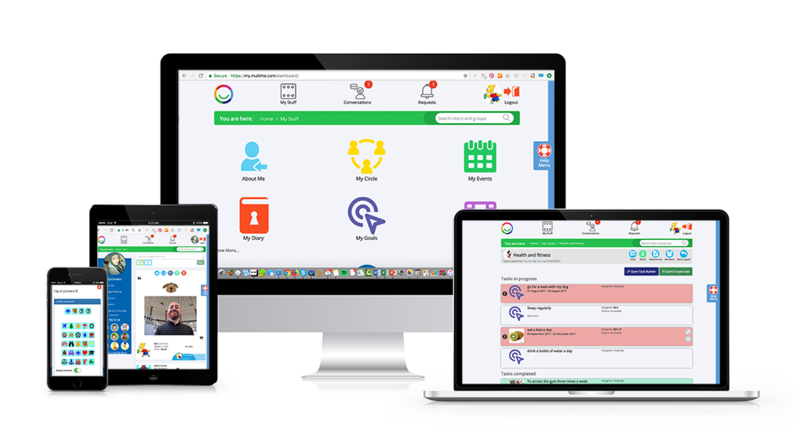 It brings together the latest technology and social media approaches to create a unique and powerful solution to person centred working for use in education, health, social care and home based settings. Background. After extensive research since 2008 involving The Rix Centre (University of East London) in helping to develop an early software prototype, Multi-Me Ltd. was formed in 2010 by Charlie Levinson. The Multi Me Beta platform was launched in July 2011, Multi Me Vs.1 in July 2012, Vs.2 in September 2015 and Vs.3 (current version) in December 2017. Read more about our company profile here. Technology overview. Built using the latest responsive HTML5 web technologies, the multi me platform is optimised for use on smartphone, tablet or PC. The platform offers a fully WCAG 2.0 compliant interface within a safe, secure environment. Additional features include user access controls within closed networks, events and calendar planning, in browser video recording and task co-ordination. Multimedia. multi me allows users to upload, capture or embed media from a variety of sources throughout the platform. Users can keep their media organised in their My Media library and create shared libraries for others. multi me makes using and managing multimedia quick and easy. Designing with accessibility in mind – simple is usable. For users with cognitive disabilities multi me needs to be very easy-to-use and accessible. We've strived to not only conform to WCAG guidelines, but knock them out of the park! Everything from font choices, to considerations of negative space have been painstakingly deliberated on to ensure that the site is both usable and accessible to all. Server and security. multi me is a web-hosted application. Our secure AWS servers are backed up on a daily basis making sure that we can recover data in case of the rare chance that there is a problem with the site or database. Security is our number one priority, we make sure that the website is protected against all common attacks. The website operates over an SSL connection making sure that all data transmitted between the servers and the web browser is secure and encrypted. We also use a similar process when storing any data. System Requirements. multi me is an online application that requires a broadband connection to access. For optimal viewing, multi me is best used with more modern browsers, such as Internet Explorer version 9 and above. multi me utilises webcam technology to allow users to capture media directly in their browsers. If your device does not have this technology built in, a simple USB plug and play webcam (with audio) is recommended.